With news that the UK could become a technological hotbed for driverless car testing, a recent survey carried out by Satrak has discovered that the public are still unsure about safety aspects regarding the new technology. With Jaguar Land Rover about to start investing in driverless vehicles, our results found that 55 per cent of those questioned said that they would not feel safe in a driverless car, and another 66 per cent said that they would not be happy to have their children travel in one. Although 51 per cent of those questioned admitted that they thought driverless cars are a good idea in general, 57 per cent said that they would not buy a driverless car and 80 per cent agreed that more training should be provided to those buying one. 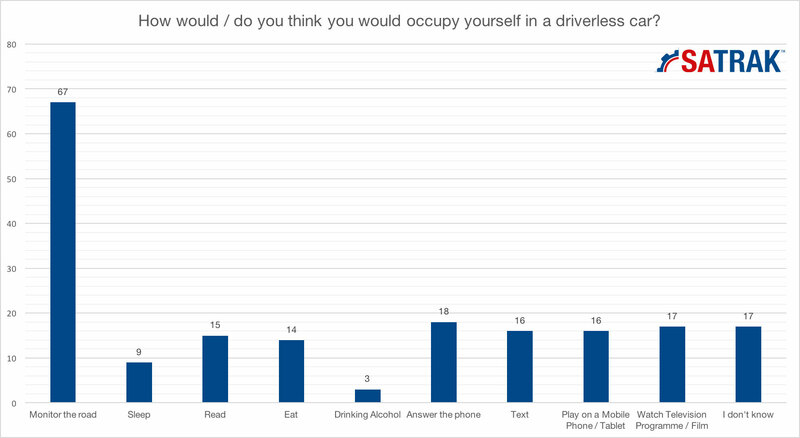 When asked about what they would do to occupy their time in a driverless vehicle, 67 per cent of respondents said that they would still monitor the road over the options of talking on the phone, eating, reading, or playing on a mobile or tablet device. As the technology is still in the testing phase, it is perhaps expected that people would harbour concerns about driverless vehicles until the technology becomes the norm. However, the results found that like normal cars, people would also base their opinions of the technology both by the brand of the vehicle and the country where it originates. When asked whether they would trust a car manufactured in Great Britain, 48 per cent of respondents said that they would, with 41 per cent of respondents also stating that they would trust driverless cars from Germany. That said however, 87 per cent of respondents indicated that they would not trust a driverless car if it originated from France and 93 per cent of respondents gave the same response to cars manufactured in the Czech Republic, home of Škoda. Broken down into brands, respondents were also clear about which car manufacturers and tech brands they would trust to build the new technologies. The most trusted brand was found to be BMW, with 52 per cent of respondents stating that they would trust a BMW driverless car. Volvo (39 per cent), Mercedes (36 per cent), and Audi (34 per cent) were also to be found amongst the most trusted. Despite this, only 19 per cent stated that they would trust a Tesla driverless car, with Google (18 per cent), Škoda (15 per cent), Citroën (14 per cent), and Uber (3 per cent) also performing poorly. In August 2016 Business Insider UK reported that Uber, Google, Toyota, BMW, Volvo, Nissan, Ford, General Motors, Daimler (maker of Mercedes-Benz), Audi, Baidu, Honda, and Hyundai are all working on driverless technology, with Apple being placed on the “maybe” list.